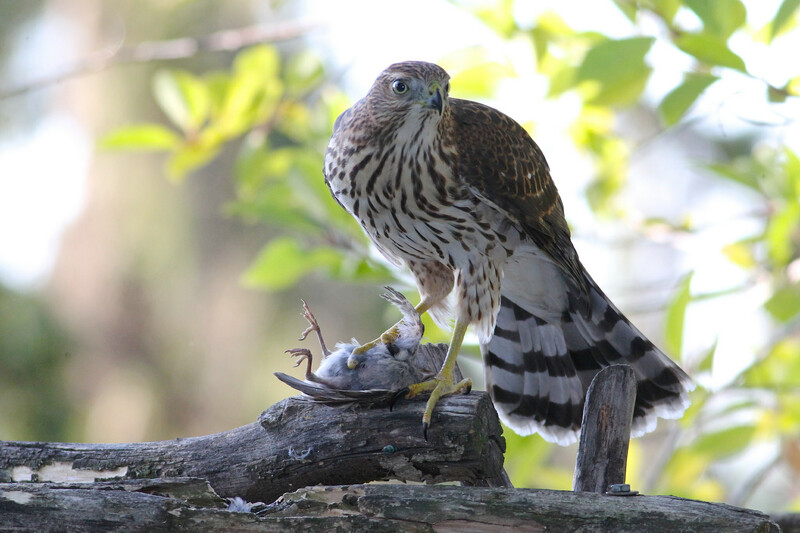 A Cooper’s hawk flew into my garden the morning before the vernal equinox. Two more days until my daughter’s birthday, and the raspberries she loved last summer are long gone. My planting box is filled with last fall’s thick and still-curling kale, winter-stunted broccoli now blooming with white florets, and onion and garlic amid the early-rising spring weeds. Already shiny green leaves twine the raspberry canes. 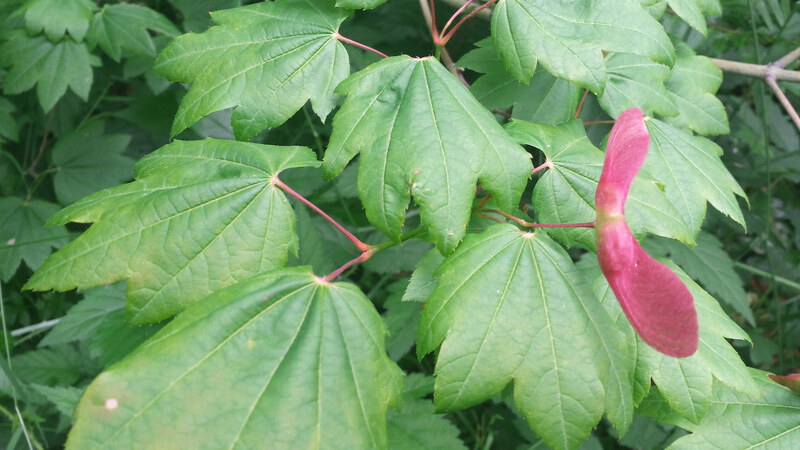 The vine maple’s red buds unfurl in the bright morning, while in the dark ground below, its roots revive and spread through the ashes of my daughter’s unborn twin brother. Near the purple crocuses sits a bucket filled with rainwater and fallen laurel leaves. On its muddy rim is the hawk with a dark reddish head and a pattern of red dashes across a pale breast that signals an avian Morse code of danger and death. It’s a serious bird. The hawk means business, or the end of it, for the bushtits and black-capped chickadees who suddenly fall silent in the cedars and holly tree. My morning had been a mundane whirl of motion without end or destination: sending emails for my daughter’s summer camps; tracking down foundations and their IRS forms; filling out online grant applications; reassessing goal charts; checking off old to-do lists; creating new to-do lists. I had stepped out of my dim basement office, with its perpetually musty smell from past floods and recent dust, wanting only respite from a day of forgettable moments. I stepped into a day of sudden and sunlit alertness. A day when you know the world has shifted out of cold and dark. A day that nudges you into another season, where wind softens to a breeze against your skin, and seeds germinate in the moist black earth below your feet. The world’s turn to spring brings the Jewish holidays of Purim, that rowdy remembrance of a displaced people’s near escape from murder and pogroms, and Passover, that rebellion from slavery in ancient Egypt and exodus into bittersweet freedom. Along for the ride is this seemingly annoyed raptor, all death and hunger and sharp eyes and razor talons grasping the bucket’s rim. The hawk bends to drink water in the luminous morning. Cooper’s hawks always seem annoyed, as if ready to claw and chew at fate itself. That’s just anthropomorphizing, of course. What Cooper’s hawks are, instead, are short-winged raptors capable of fast flights across an urban forest scattered amid backyards and parks. Cooper’s are small hawks that ambush small, fast birds (though I’ve seen them stoop Steller’s jays) usually at feeding or roosting sites, and it shows in their alert, if not edgy, temperament. I’ve never seen a Cooper’s with the patient bearing of a red-tailed hawk atop a streetlight or the deadly confidence of a bald eagle gliding above a nearby arterial road straight to a local park’s coots and mallards. Cooper’s seem all too aware that the hunting will be slim, if due only to all the neighborhood cats. Compared to the eagles and ospreys cruising above the neighborhood lake, not to mention the local coyotes, a Cooper’s is rather small beans as predators go. But maybe all this is just anthropomorphizing, too. Cities make fabulous habitats for hawks, eagles, and even owls. From mice to rats to cats to crows to pigeons, there’s plenty of easy food to be found. Maybe the hawk was just thirsty. Maybe the hawk needed stillness and solitude. Maybe that’s still more anthropomorphizing, but I don’t care. Maybe we all need grace as the world leaves winter for long, bright days. My garden, with its butter lettuces and sweet peas, its wild mint and Albion strawberries, is supposed to be such a pretty, peaceful place. But it’s spring, so Pharaoh must be here, too; like any challenged ruler, his chariots thunder in pursuit of slaves crossing into new life. Lurking at the edge of the spring revelry, too, is Haman, Purim’s villain who plants lies and plots murder. No release into warmth and light is an escape from danger and death. My garden, my refuge of basil and violets, has its own share of small deaths. I’ve come upon a centipede stinging an earthworm into a stupor. I’ve lifted the earthworm onto a leaf and left it at a safer place, but is any place safe, really? I can’t be everywhere protecting life from life. And didn’t that mean the centipede went hungry or just came back later for its prey? And whatever could I have done when I came upon a spider spinning a bee into a gossamer coffin? All this bee was doing was trying to feed her hive’s young, and I imagine she was a young worker herself, and not yet sufficiently experienced in the world to avoid my heirloom tomato patch where dew-wrapped webs stretched across Bonnie’s Best and Gardener’s Sweethearts. I’ve seen those webs each fall as I’ve pulled back vines of withered leaves to search for the remaining Cherokee Purples to make shakshuka, or those final Sweet Millions for that last pot of gazpacho, knowing that the old year’s circle was coming to a close and the holiday of Rosh Hashanah would soon bring a new year. But a hawk in my garden? To a hawk, this isn’t my garden. It’s just another place of haunts and hunts, one of many places to kill, eat, sleep, and kill again. 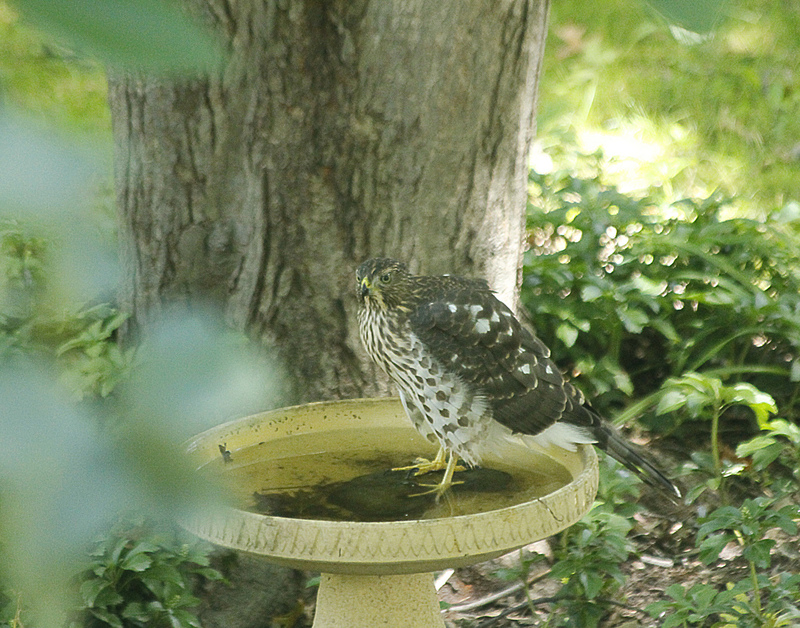 Or sip water, as the hawk does on this morning. 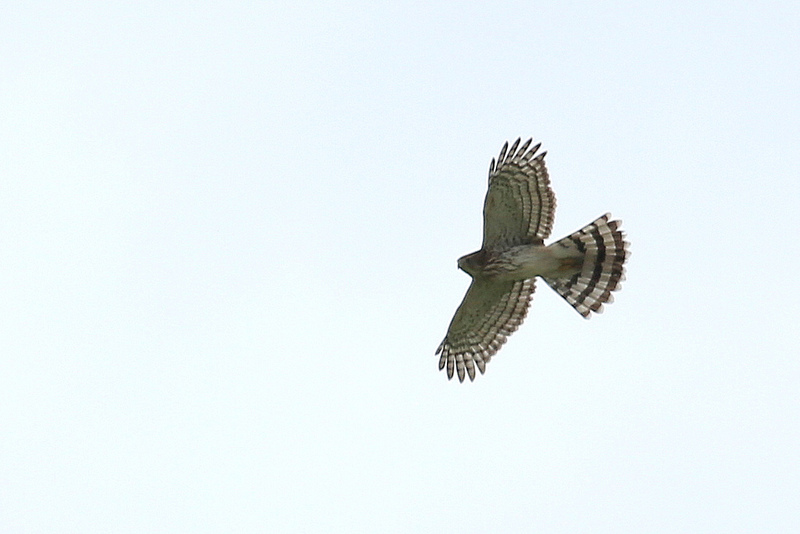 I’m grateful for this Cooper’s hawk, though I don’t understand why. Bird-watcher and naturalist that I am, this is quite a sight: a wild hawk just a foot or so away. 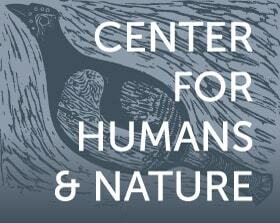 Ornithologists would say otherwise. 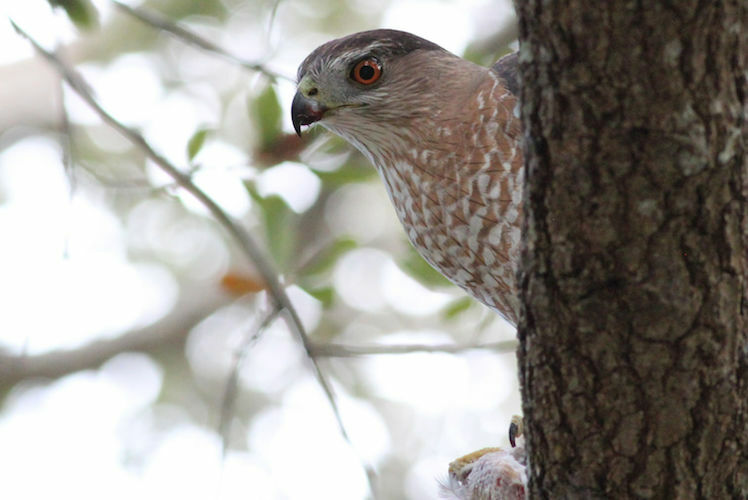 They’d say Cooper’s hawks do just fine in urban areas, and some cities are loaded with them. Just the same, it’s one thing to hear that Cooper’s are everywhere if you only look, but it’s quite another to look and then see one in your backyard. But it’s more than that. I am trying to learn gratitude, just as I am trying to learn to say morning prayers. Morning prayers are about gratitude for distinguishing day from night, for removing sleep from the eyes and slumber from the eyelids, for giving strength to the weary, for struggling with God, for being enrobed in (or at least capable of) illumination. Gratitude for land stretched across the water; gratitude for this habitable world of Cooper’s hawks and centipedes and spiders, perhaps the only world anywhere in the cosmos where we can live. In an odd way, perhaps the songbirds nesting in the neighborhood are grateful for this thirsty hawk, or would be, if they could feel gratitude. Cooper’s and songbirds have their own complex relationship. Nest too close to a Cooper’s hawk’s nest, and songbirds have reduced chances of their chicks surviving. Nest too far away, and success is also problematic. But nest not too close to a Cooper’s nest but not too far either, and songbirds can raise their young in an avian-protected zone where a Cooper’s presence deters jays, squirrels, crows, and other predators. From robins to sparrows to wrens, my garden does have songbirds. Do I have to be grateful for everything? I’d rather have two children than one. I can’t lie to myself when the spring sunshine is burning bright and pure into my eyes. Yet I’m not crying. Sadness isn’t only sorrow. Sadness is also a seed that germinates into memory. As long as I’m sad, my unborn son, my daughter’s unknown brother, is remembered. He will never know Purim or Passover, radishes or raspberries. As long as the vine maple lives, so does what’s left of him held within its roots. But I don’t want this necessary sadness to rot into bitterness. I want to accept my son’s death and all the other deaths in my garden (not that I have any choice about it) as if it was a compost that helps me grow awareness of what I do have: my daughter, who is healthy and growing and who will soon eat these raspberries and sweet strawberries; this morning; this sunlight; this messy garden of green weeds and yellow primroses, of a silver duct-tape covered watering bucket, of black compostable seedling boxes scattered about, of wandering tribes of raccoons returning to claw up all I dig in. And this Cooper’s hawk, now still. Perhaps the hawk had counted on being unseen. Perhaps the hawk had come to my garden many times before, secure in the solitude afforded by my self-absorption, my preconceptions of what’s in the garden with me and what’s not. I have learned some things in my life. I know a few basic courtesies toward the wild. I know I need to be still if I want to truly see the hawk. I need to act as if I don’t know the hawk is here. But I do know the hawk here, and I want to see this predator. I turn toward the Cooper’s so slowly I can hardly feel myself moving, but the hawk sees me. The hawk is gone in an opening of wings, a beating of heart, a rustling of laurel leaves.